Walter Aubrey Thomas (1859–13 September, 1934), was a British architect. Walter Aubrey Thomas was born in 1859 at Tranmere, Birkenhead. He was the son of Thomas Glegge Thomas and Elisa Catherine George. Thomas Glegge Thomas was architect to lord Stanley of Alderley. As a young man, W. Aubrey Thomas served his articles with the very well-known architect at that time in Liverpool, Frank Doyle. and established his own independent practice in about 1876. His works consisted mainly of commercial buildings. He has been described as “the most individual Liverpool architect of the early 1900s”. At least seven of his works are designated by English Heritage as listed buildings *, of which the most notable is the Grade I listed Royal Liver Building and of course the Grade II* listed Tower Building. Sharples and Pollard in the Pevsner Architectural Guides state that “his work shows admirable inventiveness and stylistic variety, as well as ambition matched by technological resourcefulness”. In 1886, Walter Aubrey Thomas married Maud Paris. Her family were said to be of Greek extraction. Together, they had seven children: Walter Glegge, who died in 1907 at the age of 21. Louise (Lulu), followed by Dorrit, Winifred (Winsome), Edward (Bill), Oliver and Humphrey. Despite all of his commitments, W A Thomas appears to have been a good father. The boys were educated by home tutors and the girls were sent to Cheltenham Ladies College. The family home, designed by their father, was called Bleak House – now Brooke House – at Parkgate. Later, another house was built for them at Dunstan Wood. Sadly, toward the end of his life W A Thomas had to move to a small bungalow in Neston where he remained for the rest of his life. He died on the 13th September 1934. Although he was celebrated for his work, he shunned publicity. 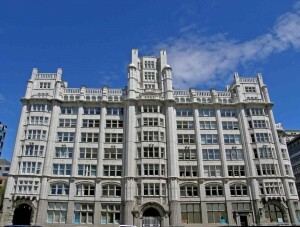 After the Liver Building was completed he was offered a knighthood, which he declined. the lack of literature about him seems to confirm that he was a modest man who avoided publicity, despite his success as an architect and businessman. However, he appears to have lost the fortune he had previously gained in the great “Crash” of 1929. There is no reason to believe that he went bankrupt and the only explanation for this change of fortune must ascribe itself to this financial catastrophe, which rendered so many penniless. His interests in life were: The works of Charles Dickens. He went to the great lengths of naming some of his children after the well known characters ; Dorrit, Oliver and Humphrey (although the latter was also a family name). He even called the house built at Parkgate, “Bleak House.” Fishing was also a favourite pastime. He built a fishing lodge in North Wales, where he spent much of his time fishing in the river, which runs through the property at Pont-y-Gwyddel in the Welsh countryside, which he was so fond of. The lodge still stands there today. It was most likely constructed at the beginning of the nineteenth century according to its style and it is built of wood. His great passion was gardening. In earlier days when he was very active and productive in his profession, he would return home and spend time digging and tending his garden. *New Zealand House, Lord Street Arcade Grade II listed, Brooke, State Insurance Building Grade II listed, Tower Building Grade II* listed, Royal Liver Buildings Grade 1listed, Crane Building Grade II listed, Dunstan Wood, Elmhurst Grade II listed. In August 2015 Cartrefle fishing lodge the country hide away of William Aubrey Thomas in Pont-y-Gwyddelat, near Abergele went up for sale for £750,000. The lodge set in 21 acres with more than a mile of double bank trout and sea trout fishing, was built just after the First World War. The timber lodge retains its original panelling and has a rod room, sitting room, four bedrooms, bathroom, shower room, and kitchen diner. However, if this is not to the buyer’s taste, there is planning permission to replace the fishing lodge, with a five bedroom/five bathroom house.